Imagine How Great This Feels!!! Rich walked into our Boot Camp in January 2013. He weighed 350 pounds; give or take a few. He was about 60 years old and had not worked out in decades. He was taking medications for a myriad of things: diabetes, high blood pressure, just to name a few. Even his color was off; his complexion looked gray to me. We talked for quite a while that day. He told me his goal was to lose 100 pounds in two years. He was also dealing with a few fused cervical vertebrae from an earlier surgery. He had limited mobility. He was in pain; his neck hurt, his knees hurt, his hips hurt. I was a little worried ( okay, a LOT worried)…But, I saw a spark in his eyes and I thought, “He can really do this.” So, he got the okay from his physician and we started working on his goal. Rich attended (and still does) Boot Camp faithfully. He rarely missed class when he started. Initially, we had to modify all the exercises. It was very difficult for him to even get down on the mat to do push ups or core work. He kept at it; slowly working his way down and slowly getting back up. After the first four week session, Rich reported to me that he had lost almost 20 pounds. He followed the Hauk Fitness nutritional plan. He stopped drinking soda and had really cut back on his daily fast food trips. I watched him get stronger. Then, one day at boot camp I noticed he jogged a little bit. Maybe about 50 yards or so. I ran up to him and asked, “I saw that! How do you feel?” He looked at me and said, “GREAT!” I said, “Good, but let’s still take it slow.” I saw a smile creep across his face as if he knew something I didn’t. Well, he did. I soon learned what it was: He is a very determined man and he did not let anything take him off the path to his goal. He and his wife, Cathy, continued to live life. Just because he was working on a large weight loss, life still happens. So, there are birthday parties, holidays, picnics, and bar-b-ques. He still lost pounds. He went on vacations and would actually lose weight. He’d come back and say, “Lost another 4 pounds.” And, there was that little smile again. The months fell away, the seasons changed, and Rich was steadily losing weight. It seemed as if with every pound he lost, he gained that much strength and endurance. He was a regular at one of the early morning boot camps (We have 3) and one Monday at one of our the 6 PM boot camps, I saw him again. I walked up to him and said, “Are you doing a double today?” He said, “Yes, I’m going to try it and see how I feel.” This happened about six months into his weight loss journey. At the end of class I caught him as he was leaving and said, “Well……?” He said, “I’m not gonna lie, it was tough, but I liked it.” From then on, when his schedule allowed, he would be at a morning Boot camp class and a 6PM class as well. Yep, there was that smile. About three weeks ago, we were at Sunset Meadows Park for boot camp (we are outside in the summer months). I was running a warm-up lap with Rich and we were talking. It was a Friday, which means we were getting prepared to run up and down the toboggan hill. He said to me, “I’m going to try and run 2 laps without stopping today.” Just so you understand how far that is; one lap is 9/10’s of a mile. He was going to run (almost) 2 miles. I said, “GO for it!” I watched him move ahead of me and he said over his shoulder, “I haven’t run two miles without stopping since I was a teenager….if then!” We both laughed. Remember that determination? Yes, he finished two laps without stopping. This time the smile went from ear to ear! Oh, and he also completed 8 toboggan hills. He built up his overall body/core strength to a level that has now reduced the stress and strain on his knees and back. He is painfree. He completes our training workouts without any modifications. He has lost over 15 inches around his waist. He has increased the mobility of his neck. 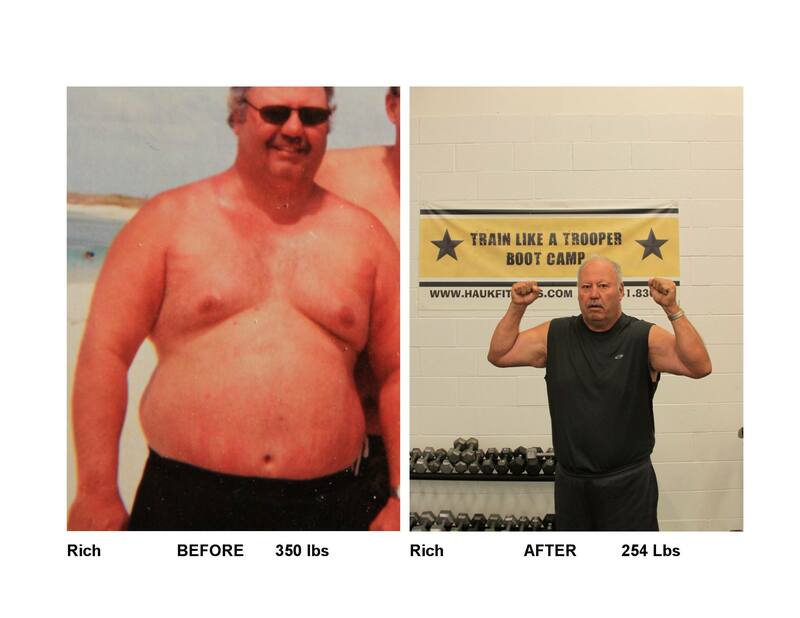 Rich is off all medication and his physician is amazed at the changes he has made to his body and health. He has more energy than he knows what to do with! His eyes are bright and he looks ten years younger. He has his mojo back! Imagine how euphoric Rich feels! It didn’t happen overnight. But, it HAPPENED! You don’t need to suffer in silence anymore. You don’t have to be frustrated and angry with yourself any longer. Get ready to feel like Rich does! We are here to help you get there! Your life is right here; right now. We know how to get you there. We use a holistic approach: We take care of the fitness part and proper nutritional plan/support. You don’t have to think about what to do or what to eat. We provide that for you. It’s going to feel like you won the lottery! Promise! Let us get you the results and the body you deserve.